When you think of Barnabrow, I bet you think of weddings. They are good, very good, at weddings here. 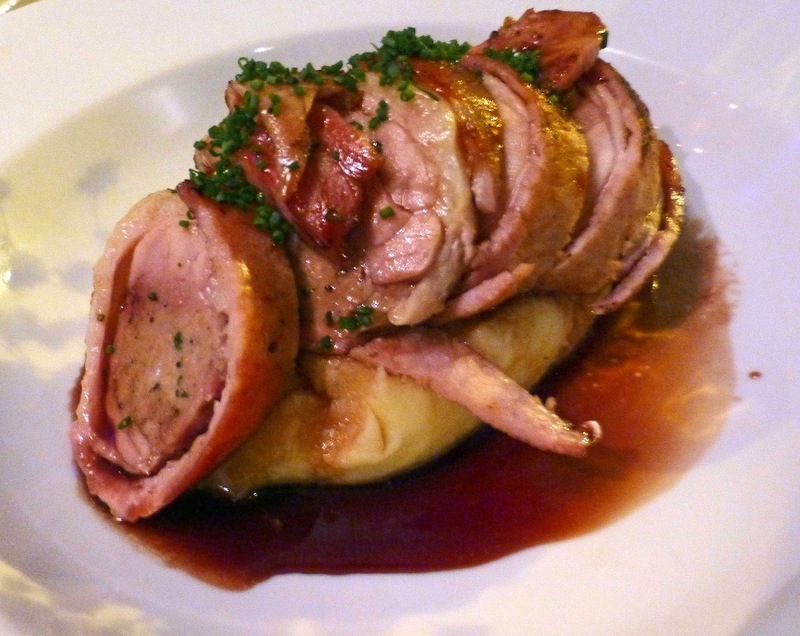 But they do much more besides, including a tremendous Sunday lunch, local produce superbly cooked and presented by Head Chef Stuart Bowes. At twenty four euro for two courses and twenty eight for three (with tea or coffee also included), it is also excellent value. We were back there last Sunday, the first wet one in a long time, for a lovely leisurely lunch. Not so leisurely though for the chef and his crew. Barnabrow is getting quite a name for its breads. The preparation started on Saturday and the sourdough was finished off on Sunday. I can tell it was well worth the wait, as good as you’ll get anywhere. Though you may not get it exactly like this anywhere else as Chef Bowes, reckons local kitchen conditions play a part in the final outcome. And local plays a big role here. When Stuart arrived here over six years ago from the Hayfield Manor, he began to revitalise the walled garden and that is now a key supply source for him. And he relies on local suppliers for much of the rest, including meat and fish. 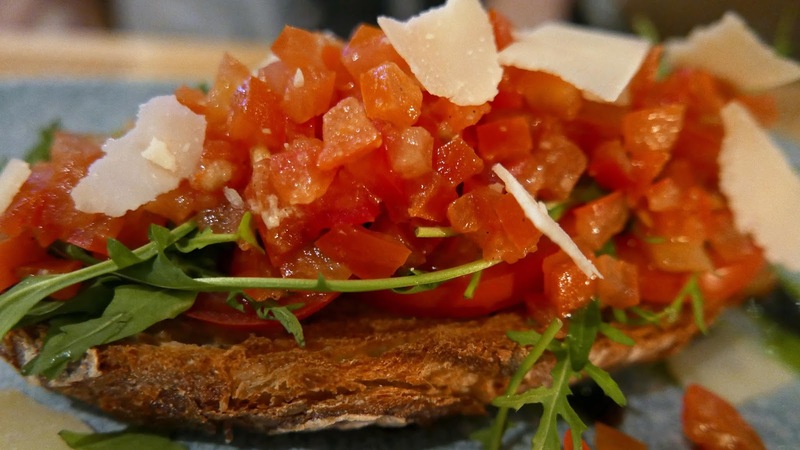 As we sample the sourdough, we take a look at the menu. 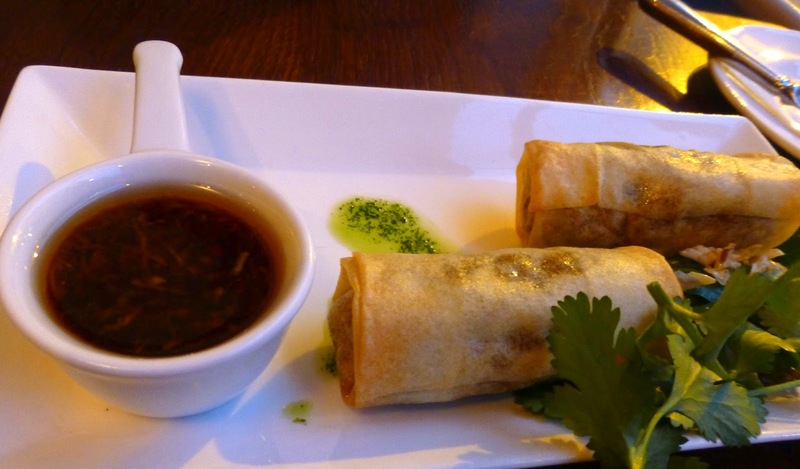 There is a choice of four starters, four mains and four desserts. There’s Whipped Ardsallagh Gloats Cheese listed and also a Potato and Leek Soup with truffled cream. 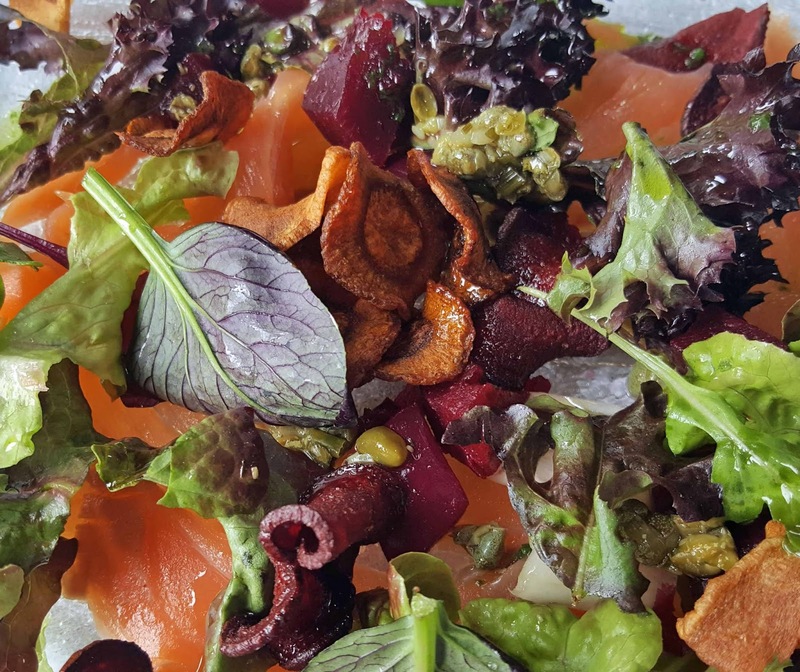 My pick though is the Oak smoked salmon with Garden Beetroot, caper and herb dressing and vegetable crisps. 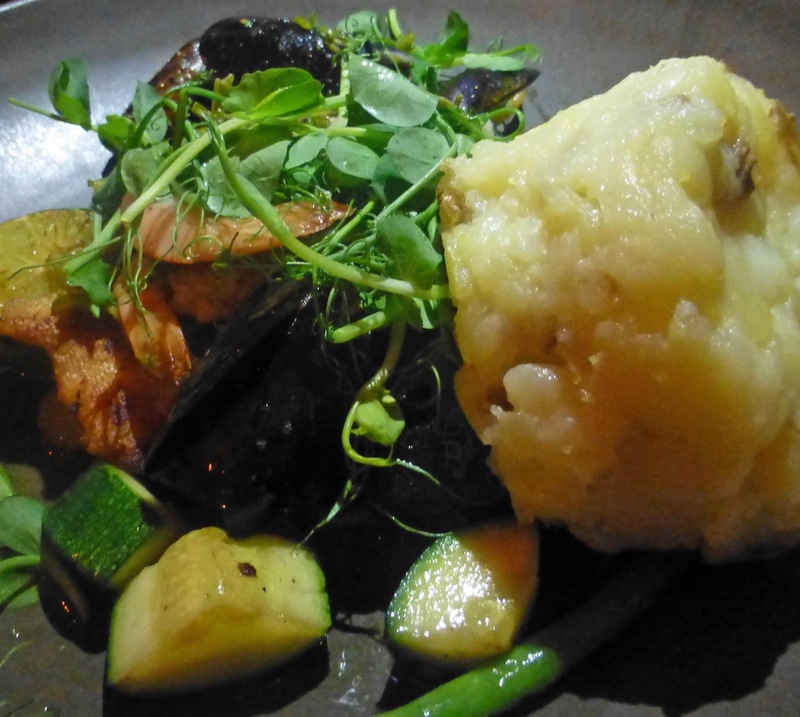 The salmon is top notch, moist and smooth and full of flavour and is enhanced by the dressing and also by the combination with the crunchy chips made locally by farmers Sandra and Joe Burns. A lovely dish. 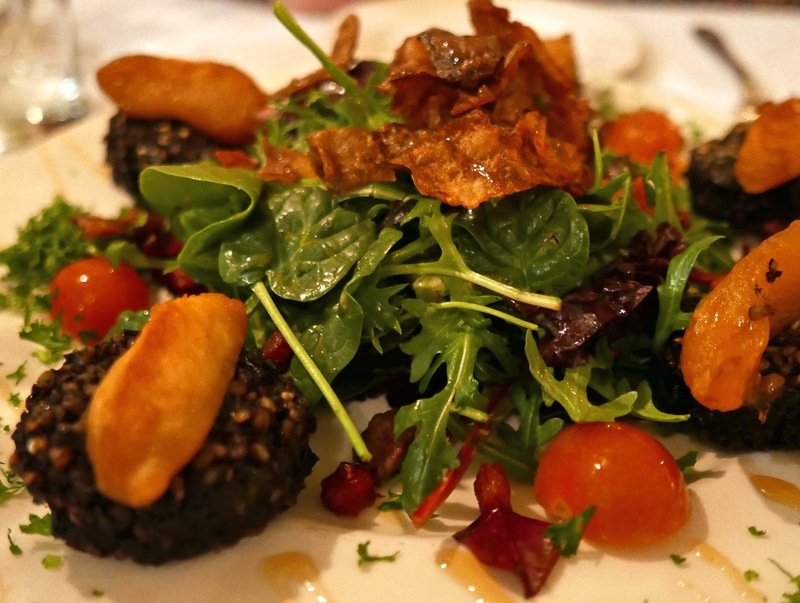 The Clonakilty Black Pudding Salad, with crispy potatoes, Feta, apple and semi-dried tomato dressing is quite a plateful but OBC makes short work of it, enjoying the flavours and the textures. This dish is very popular at wedding dinners and we can see why! Courgette are now in season and feature on the mains menu, served with new potatoes, sauce vierge, garden basil pesto and Parmesan cream. 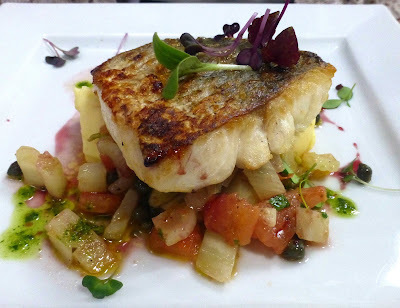 The fish option is Seared fillet of Seabass with Garden Courgettes, sauce vierge, garden basil pesto. 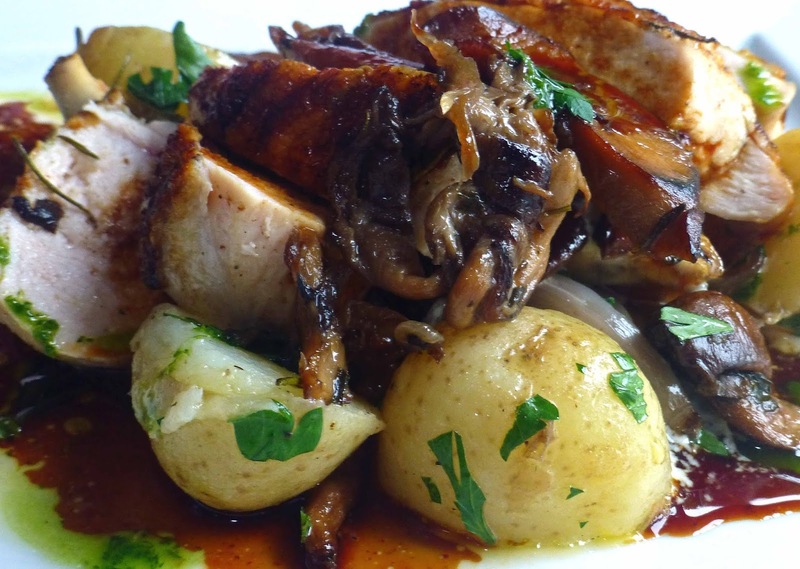 OBC goes for the Chargrilled Chicken Supreme, new potatoes, garden herbs, Ballyhoura wild mushrooms and Parmesan cream. Another delicious combination. 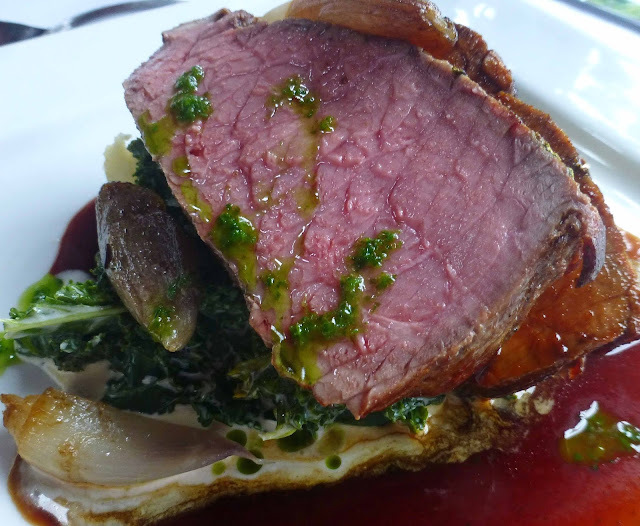 My pick is the Roast Sirloin of O’Connell’s beef, with horse-radish creamed kale, roast shallots and red wine jus. Magnificent. Cooked to perfection with unreal flavours and that creamed kale was something else. 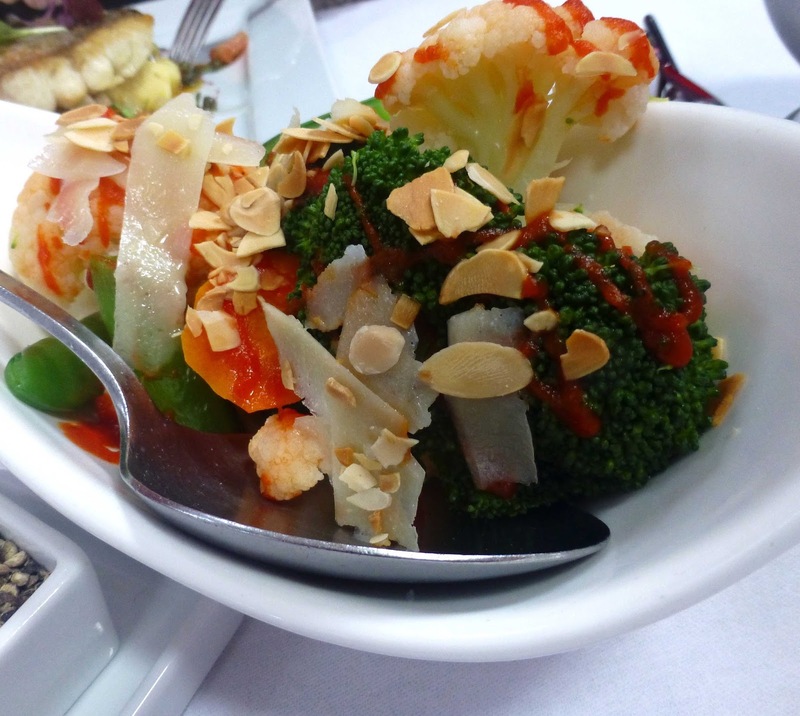 And, speaking of something else, the side dishes were also superb, beautiful roast potatoes (nicely judged fat and salt applied) and outstanding vegetables (enhanced with a scatter of chopped almonds). Nothing went back, not even a sliver of an almond! And dessert? We could have had Red Wine Poached Pear stuffed with Praline, Valrhona Chocolate Marquise with summer berry, or a selection of ice-cream and sorbet. But we could manage just one between us and enjoyed the Roast Peanut Parfait, with strawberry sauce and (very tasty) marshmallows. Coffee followed as did some gorgeous rum and raisin petit fours. As we drove home, we were thinking that the excellent meal might have had one or the other nodding off during the World Cup final but no danger of that as France and Croatia served up a goal fest. The Oyster Tavern may have been established in 1792 but while nostalgia for the (more recent) good old days (and nights) will gain you some goodwill you've got to keeping putting quality on the table. And in April 2018, The Oyster is doing just that. During our visit last week, we enjoyed two of the best main courses that we've come across in a long while. 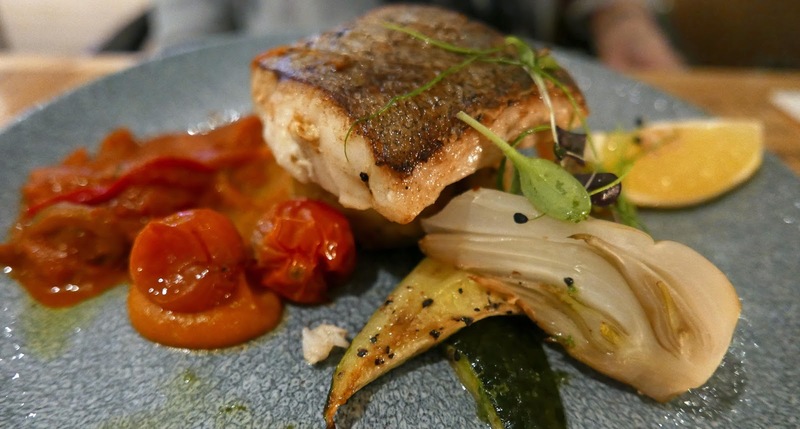 Working under renowned local chef Kate Lawlor, the team’s Pan-fried Halibut and Rack of Lamb were absolutely outstanding; and neither of the evening’s specials needed a heavy sauce. That rack of lamb, like much else here, comes from the English Market next door. 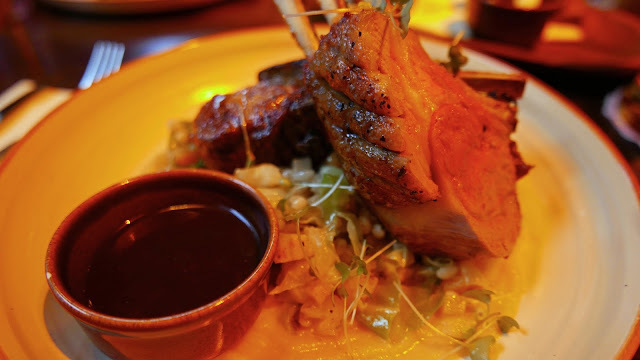 And Tom Durcan's rack was perfectly cooked (pink) with pearl barley, cabbage stew and turnip purée, Irish food at its best. Great flavour from the tender meat and I reckon I'd have eaten a bowlful of the accompaniment on its own. I enjoyed every bit of that but think I was beaten to the line by CL who hardly spoke, just purred now and then, as the fish disappeared. The Halibut, a lovely piece of fish lovingly handled in the kitchen, its delicate flavours respected, was served with charred tender stem broccoli, pickled beetroot and oyster sauce. And there was a tasty side of crushed potato with dillisk and tarragon. The main choices also included a range of steaks (from Tom Durcan), baked sea-bream, two vegan friendly dishes Cauliflower Steak and Char-Grilled Aubergine Charlotte, a Chicken Cordon Bleu (from the market's Chicken Inn) and more. 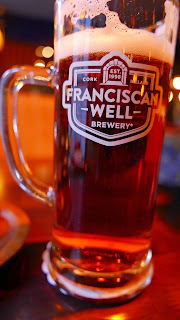 We began our guest visit with a couple of lovely cool draught beers, both by Franciscan Well, the Chieftain Ale and Rebel Red, and a look at the menu. No shortage of starters: soups, chowder, oysters (of course), scampi, a Knocklara Cheese Salad included. 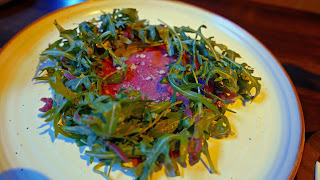 CL enjoyed Durcan's spiced beef carpaccio, with cracked black pepper and sea salt on a bed of rocket leaves while I was also impressed with the flavours and textures in the Pork and Onion Croquettes (Clonakilty black pudding and apple sauce). We were in early on the Tuesday after Easter Monday and had a chance to have a “good look”. Great welcome by the barman downstairs, a bit of chat and then he guided us to the lift, and that kind of service continued right through upstairs, and at the very end when the same friendly fellow engaged us again in a bit of banter. The restaurant looks fantastic, the island bar a feature as is a secluded area off to your right as you enter (great for a large private party). 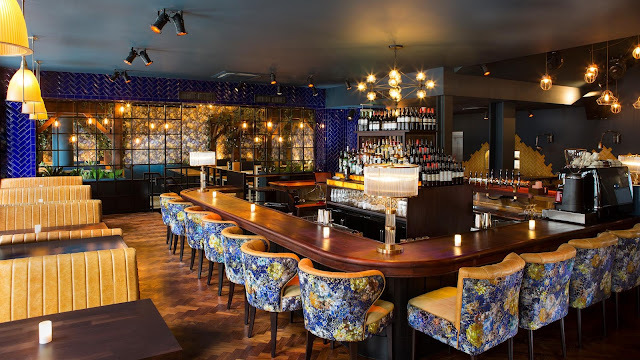 The main area has lots of booths with very comfortable seating, some lovely chairs around the bar as well (see Oyster pic below). This gorgeous dining area gets lively at weekend nights, with some of the musicians known to strut their stuff on the counter! Mightn't be the best time for fine dining then but you may still eat here as platters are part of the late night service. There is a separate weekend menu (including steak and eggs) and also a Pre-Theatre menu. We finished up though with a couple of desserts, a Sherry Trifle and a Tarte Tatin and a lovely chat with Chef Kate Lawlor who joined last October and is very much enjoying her new challenge here. Earlier, we met up with restaurant manager Deirdre Caldwell. Check a previous visit (last September) to the Oyster here. And keep an eye for our chat with Kate Lawlor - coming soon. 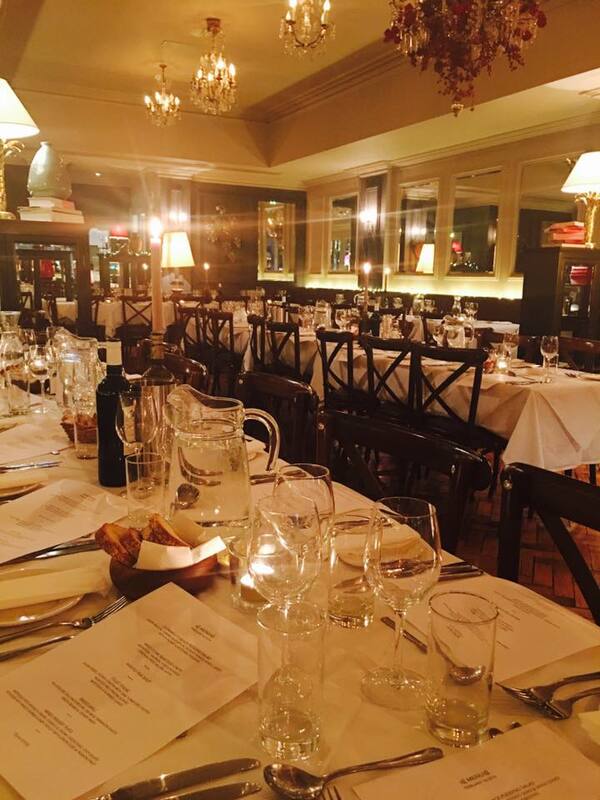 An amazing series of tapas style dishes, prepared by hosts Club Brasserie, heralded the start of the 2017 season for the Munster Wine and Dine Circle. 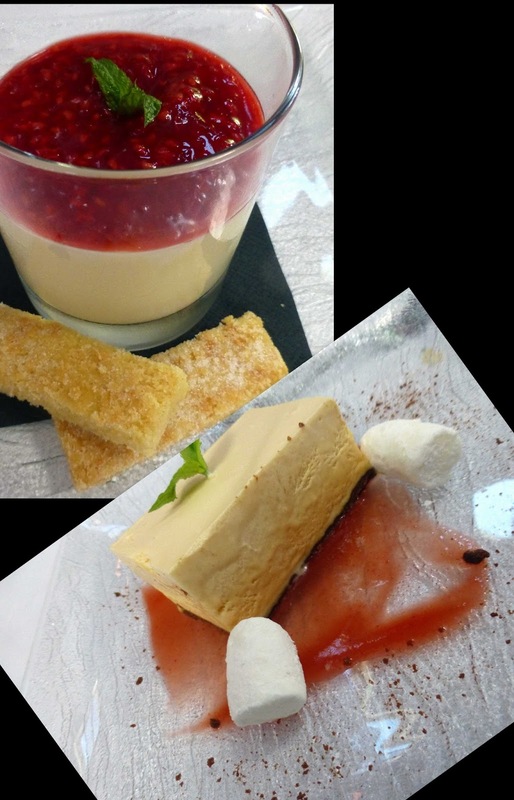 Each dish was accompanied by news of an event already confirmed in the calendar for this local group, who love their food and drink and love also promoting local produce. After a welcome prosecco, thanks to Gary O’Donovan, we had a short and interesting presentation by Cal McCarthy, Senior Sales Manager at Clonakilty Black Pudding. He told us the success of the company was down to the passion of the people involved, especially founders Eddie (RIP) and Collette. “It is available in the UK, Australia, the United Arab Emirates… we must be doing something right.” And he also told us about the right way to cook it: “..on its own, in the oven”. 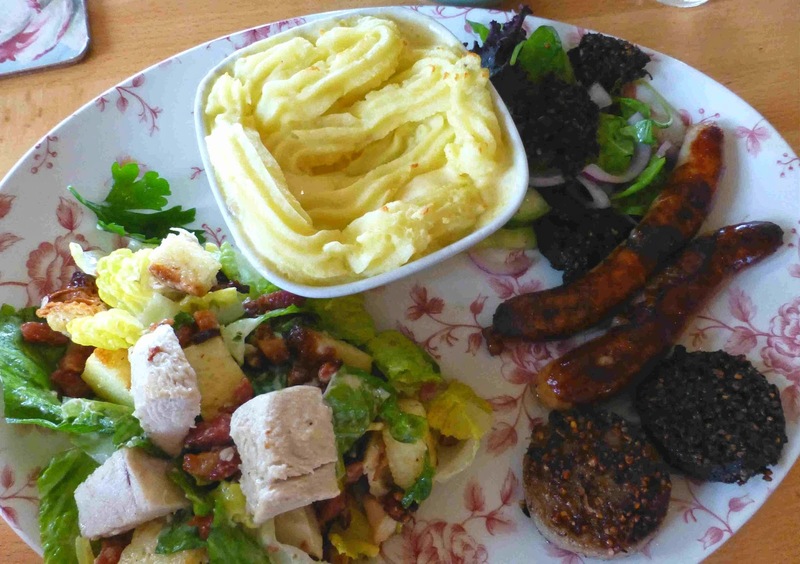 By the way, they also do gluten free black and white pudding and sausages. Beth and Harold and their staff in the Club Brasserie then began their superb service, starting with that iconic black pudding and Beth confirmed the tasty dish was indeed cooked in the oven. New committee member Stuart Musgrave then outlined the first event. In March, a group will visit Barry’s Tea, another iconic Cork producer, and the “best tea blender on the world” according to one time rival Stewert. By now, another dish had arrived from the busy kitchen, a presentation of mushrooms from the folks at Ballyhoura and mixed in were some of their new smoked oyster and shiitake, “very tasty” according to Beth. MWD secretary Beverley Mathews was then on her feet, outlining the April event. 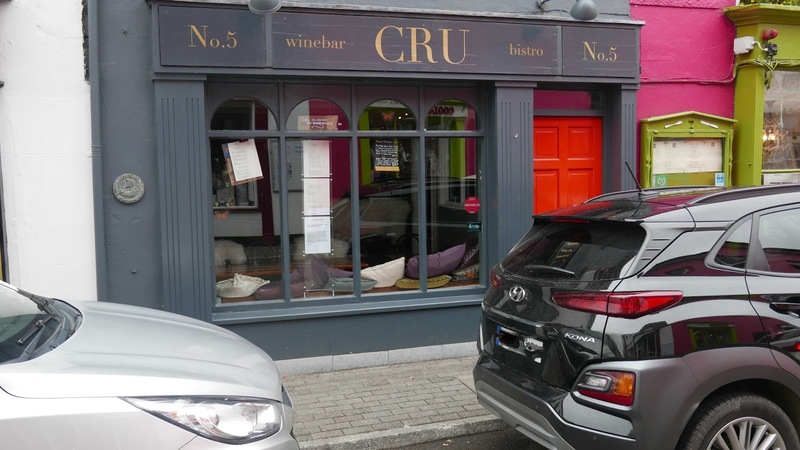 “This will give you the chance to stand in the shoes of a large scale wine buyer.” Supervalu's top buyer, Kevin OCallaghan, will be present for a tasting of some of their wines in L’Atitude in what should be a fun evening. 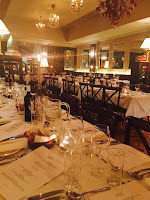 I’m not sure that there was an event for every dish and we were on to the mussels when chairperson Eithne Barry enthused about the next event, a May trip to Kinsale. She fleshed it out. A bus from the City Hall with the first stop at Black’s Brewery in Kinsale for craft beer and gin. Next stop at The Spaniard for a glass (of water?!). 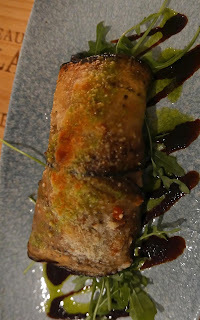 And finally, dinner at Man Friday, a dinner to be cooked by the younger generation in the long-established restaurant! Soon Eithne was telling us about the summer’s premium event, a day out in West Cork. The bus will take us direct to Gubbeen where our hosts will be Fingal and his sister Clovis. 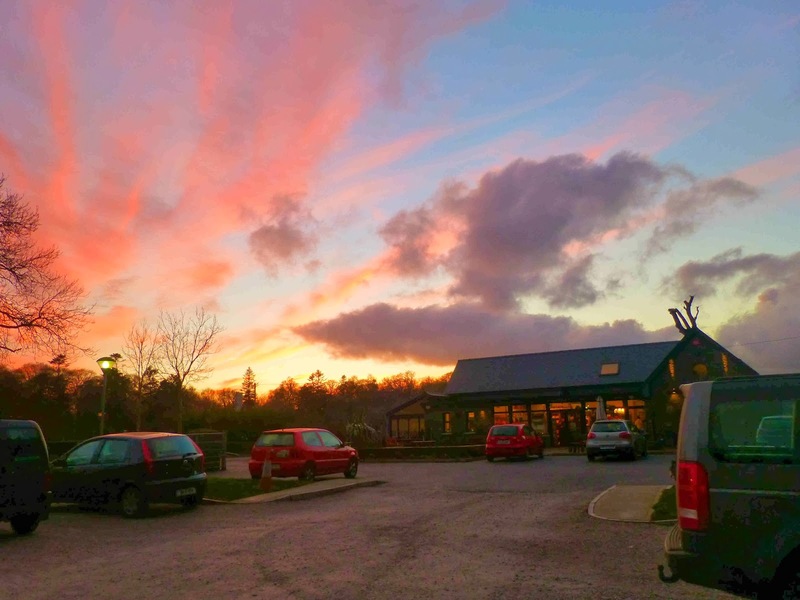 Fingal will give a tour of the farm, telling us all about the cheese, about his very special smokehouse (where he produces the most divine Chorizo and Salami and more) and about his knife-making for which he is rather well-known. Over then to Clovis who will feed us all as the July evening unfolds. 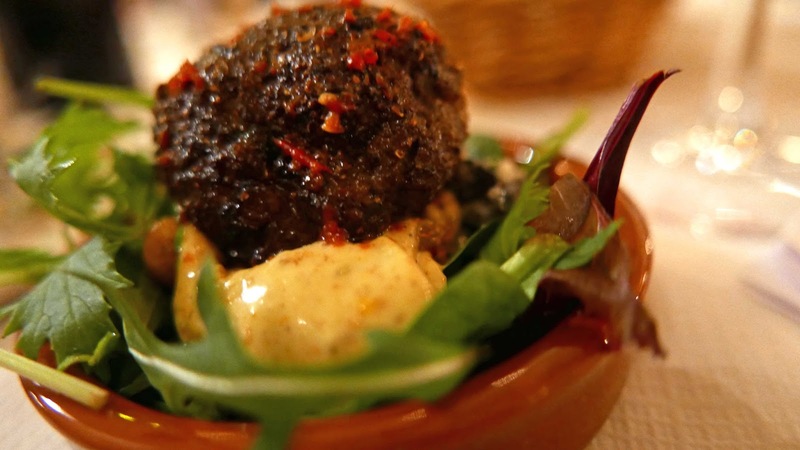 Speaking of premium, Harold and Beth brought out a very special dish, their lovely East Cork Lamb, with their own harissa oil and spiced chickpea, small and beautiful. 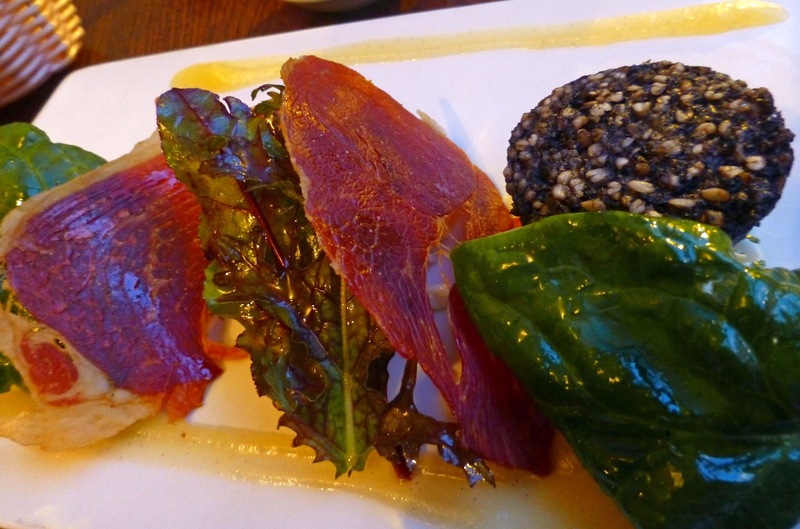 Speaking of East Cork, one of the earlier plates featured Ardsallagh goats cheese. The MWD speaker now was yours truly and my task, on Saturday September 15th, is to take a group on a short walk, focussing on the Coal Quay and Shandon, areas long associated with Cork food. 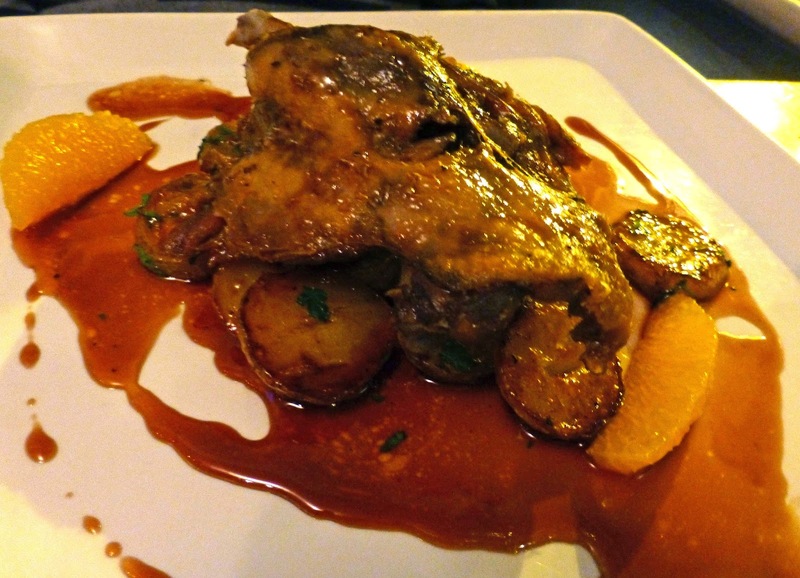 Back down to the city centre then for a late leisurely lunch in Jacques where no doubt there will be a reminder, maybe even a replica, of a dish from the good old days (but we'll leave the details up to the Barrys!). 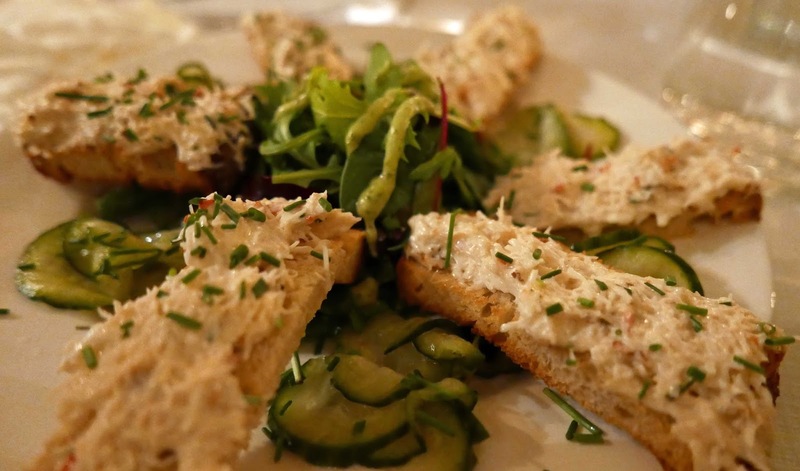 West Cork Crab was now on the menu, served with a lime chilli mayonnaise. And MWD treasurer Richard Scott took the floor to highlight the final event of the year on the 3rd Sunday of November. Lunchtime visits to Longueville House (2015) and to Ballyvolane House (2016) have proved highly successful. If it works, why change it., So this year, we are off to the Long Room in Ballymaloe where fifty happy visitors will be seated. Before the lunch, a local producer or two will be on hand to give a presentation. Looks like a great finalé to what should be a varied and entertaining programme. * The membership list is very close to its upper limit. If you are interested, please email mwdcircle@gmail.com. Fees are €30.00 single, €50.00 double. We came in off the narrow twisting road and drove up an even narrower lane, where trees meet overhead, donkeys and ducks in the small fields. 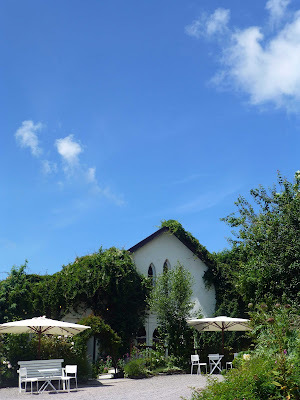 The sun was shining brightly as we approached the inviting restaurant, set in trees with parasols and tables outside. 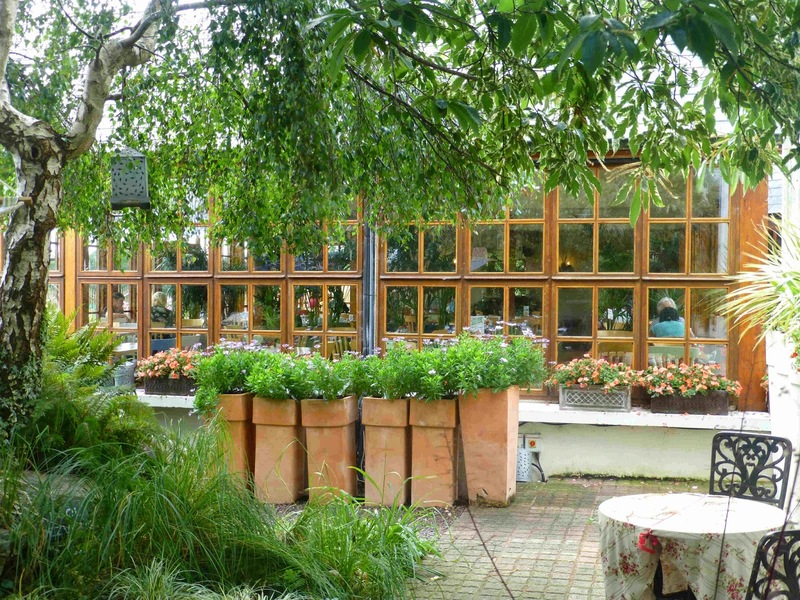 We could well have been on the continent but were in one of East Cork’s delightful venues. 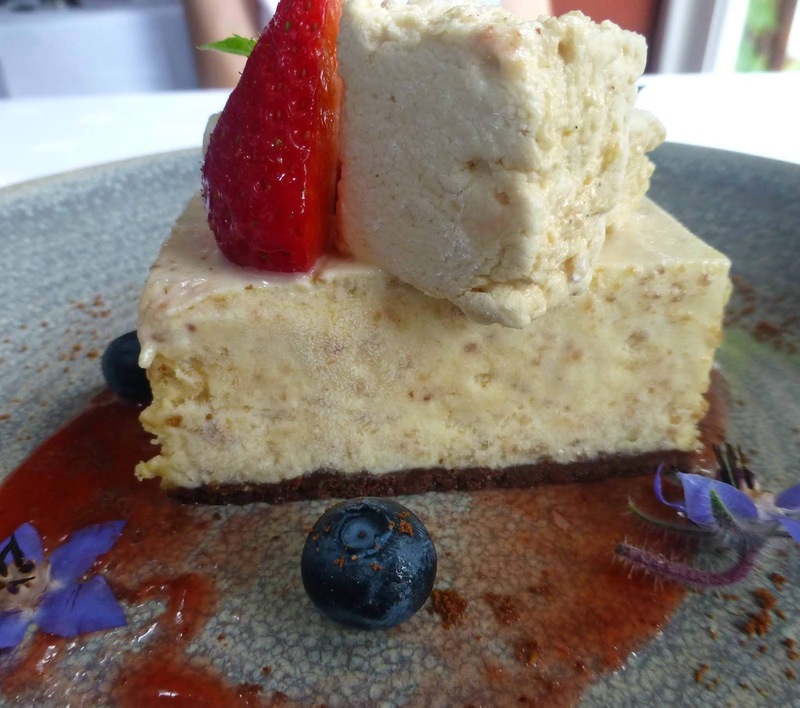 Barnabrow, twenty years in business under Geraldine Kitt, is renowned as a wedding venue. But we were here for Sunday lunch and, as always, chef Stuart Bowes delivered, much of the produce coming from the nearby walled garden. The restaurant is also rather special inside. 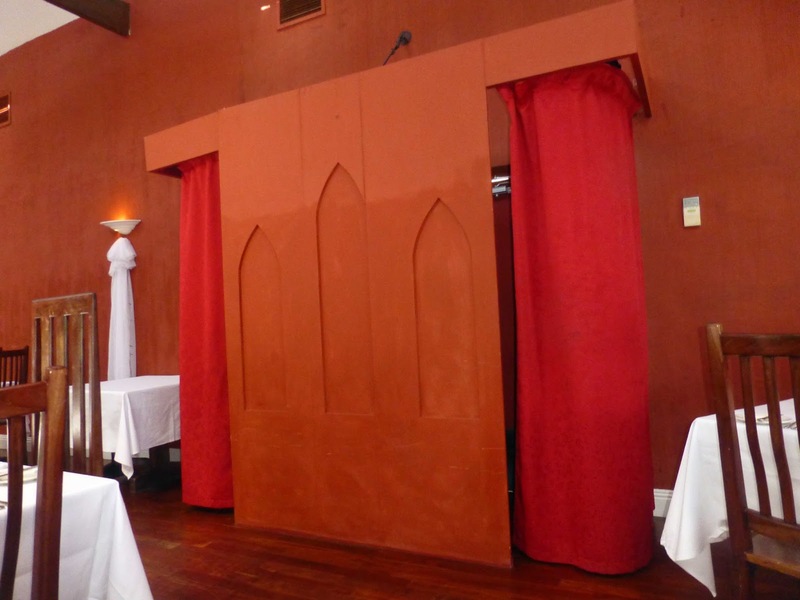 It is here in in this spacious lovingly decorated room that the wedding feasts take place. With its pointed arch windows there is a semi-religious look to it. And your servers come and go into and from what looks like a confessional. 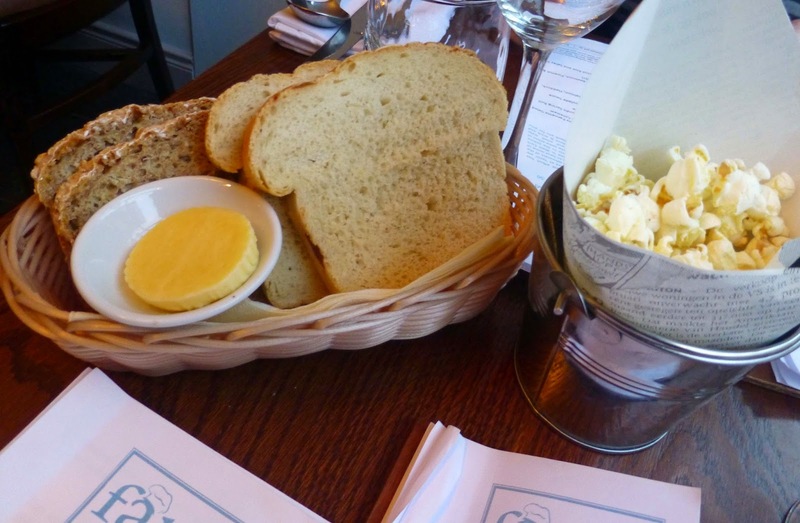 We nibbled on fresh and delicious sourdough (with Glenilen butter) as we studied the menu, two courses for 23.50, three for 27.00. Children may have half adult portions (though various goujons are available too) for 13.50. Kilmore Quay Hake, soft potato puree, Fennel, Olive & Citrus salsa, Port reduction. This was our other main dish. Superb. Empty plate went back! Creamed celeriac, truffle and toasted almonds were the ingredients of the soup but, with the day being so warm, we decided on something else. CL went for the Clonakilty Black Pudding Salad, Crispy Potatoes Alsace, Feta, Apple and Tomato dressing. 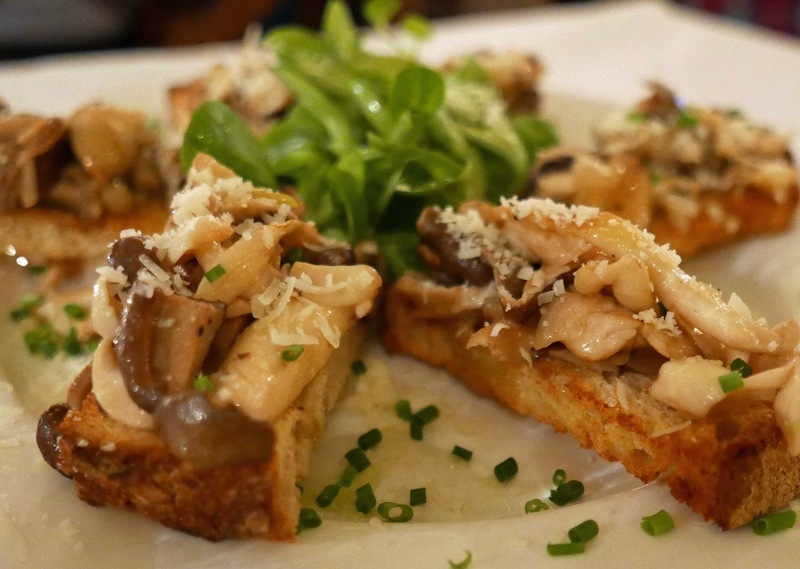 Quite a substantial starter but full of great flavor and texture. I had been looking at the Ardsallagh Goats Cheese with confit red onion and hazelnut dressing but picked the Salmon Rillette, Cream Cheese, garden beetroot, and poppy seed dorito. With contrast provided by the dorito, this was a smooth and rich delight. Lamp, stuffed pepper on right. There was beef (with Ragu of Ballyhoura mushrooms) and lamb on the mains. 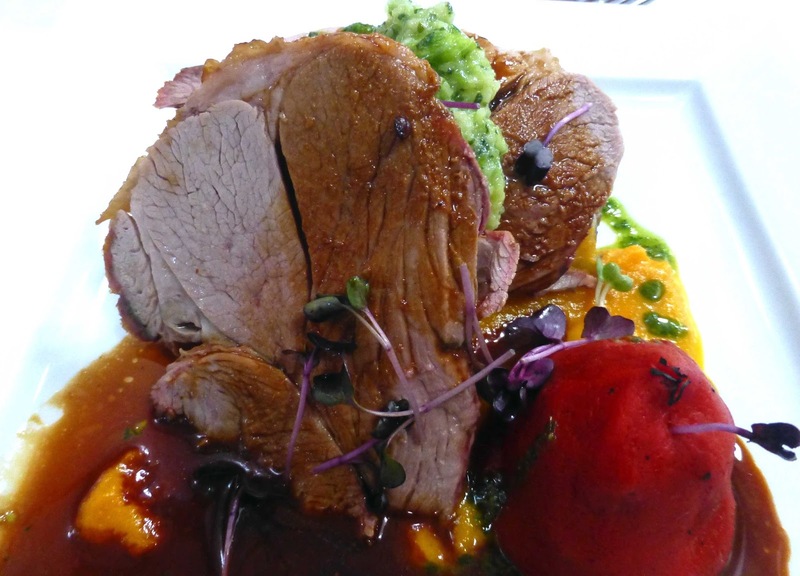 I had enjoyed the beef on a previous occasion so this time choose the Roast Leg of Kildare Lamb, Stuffed Piquillo pepper, Apple and Garden Mint Relish. A superb combination, every bit playing a part, and, for sharing, the sides (especially the full-of-flavour carrots) were just brilliant, looked well, tasted even better. We were thinking of sharing a dessert but, under some gentle persuasion, went for broke! The deciding factor here was Mum's shortbread, Stuart’s Mum that is! And that shortbread came with the gorgeous Lemon Posset with crushed raspberries, a major step-up on the little jars you often get. And, yes, Mum’s shortbread was class. 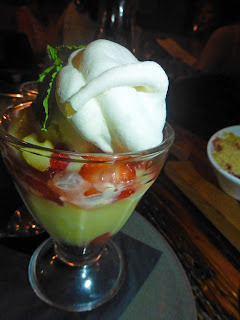 The other dessert enjoyed was the Iced Parfait of sea salt and caramel with marshmallows and strawberry sauce. I had a idea this was going to be excellent and it was. Just the job before we headed off into the East Cork sunlight for a stroll around the grounds which boasts a view out towards Ballycotton Bay and the lighthouse. With all the different buildings, the various sheltered outdoor nooks and corners, one with a good area of decking with seating, the trees and flowers, the animals, the walled garden, it is a great location for a wedding and this is the heart of the business. There is even an adjoining accommodation “village”. In addition, the house (with is many different sized rooms) and grounds accommodates quite a few corporate functions, some serious, some fun. And do watch out too for special events, such as a Valentine’s weekend getaway. Well done to Geraldine and her team on the twenty years and here’s to another twenty! Griffin’s Spinning Wheel Unveils Gorgeous Gluten Free Options! Sweet GF! Don't forget, today is Fiver Friday at the Spinning Wheel. 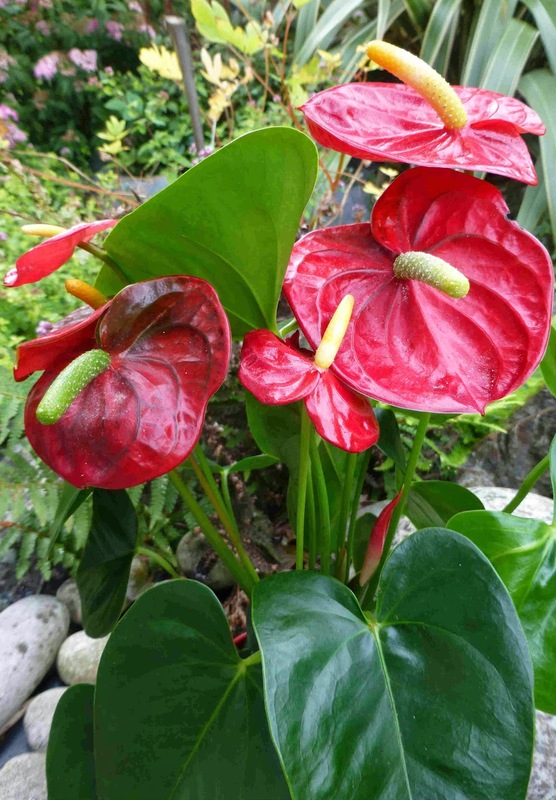 Paid a visit to the beautiful Griffin's Garden Centre on the banks of the Lee in midweek and came home from the Dripsey venue with a Eco-Friendly Champion Anthurium. I can’t eat it - that’s what the label clearly says! But I ate more than enough as the main purpose of the trip on a sunny aftenroon was to check out the new range of gluten free food that they have in their lovely river-side Spinning Wheel Restaurant, a very busy spot indeed. It is open 9.00 to 5.30, so you may have breakfast and lunch here and lots more besides. Chef Chris took me through the tasty options, starting with those Clonakilty Sausages and puddings which he tested on the visitors at last week’s World Feeder Fishing Championships. 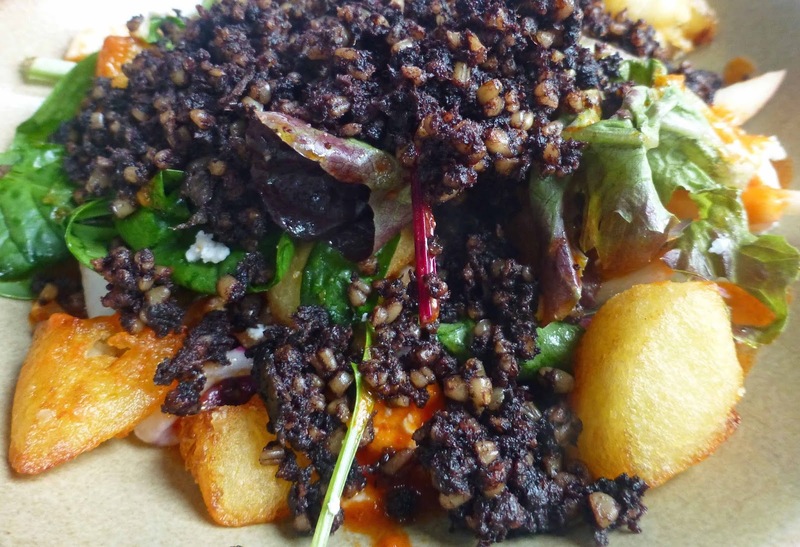 He uses the black pudding too in a delicious salad. 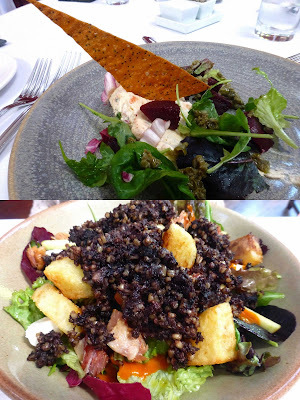 Perhaps the top salad I tasted was the Caesar, great tasting chicken from his Macroom supplier and gluten free croutons that tasted better than the average. And most impressive of all, I thought, was the Fish Pie, the excellent cornflour sauce recently developed by Chris. Many people think that Gluten Free food is bland, as Chris said. But this tasting plateful was full of great flavors, proof positive of the exact opposite. 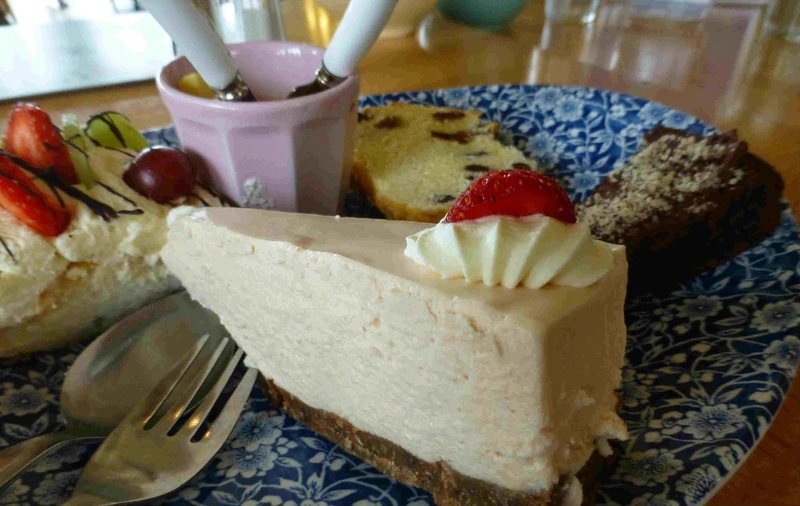 The restaurant manager Helen introduced us to Pastry Chef Mary and what a belt bursting selection she had for us, everything from a simple scone to Pavlova to a stunning Chocolate cake. No penance going GF with these kind of goodies on offer! To get the best from this, and other Heuchera, plant it a little proud of the earth! Aided by copious cups of coffee, we finally managed to get up from the table and enjoyed a stroll around the magnificent garden centre which will be familiar to many of you. Had another chat with Miriam and got lots of gardening advice! They also have a home section and that includes an indoor plant display and it was here that we bought the Anthurium, pictured left! * You have an even better excuse than usual to visit Griffin's today. It is Friday and they have a Fiver Friday offer in the restaurant. Check it out here. I think Bramley Lodge Café has been perpetually busy since Gillian Kearney opened the café in 2009. It is situated just off the N25 (main Cork-Waterford-Rosslare road) at Cobh Cross. Parking has been improved here, it has long opening hours and so it is a very convenient stop. And a highly recommended one. My latest visit came this weekend. The welcome is informal but warm, reflecting the friendliness of the staff. By the way, informal doesn't mean inefficient service, far from it. We were immediately directed to a table and soon had the menu and the list of specials and, as it turned out, we ordered mainly from the latter. 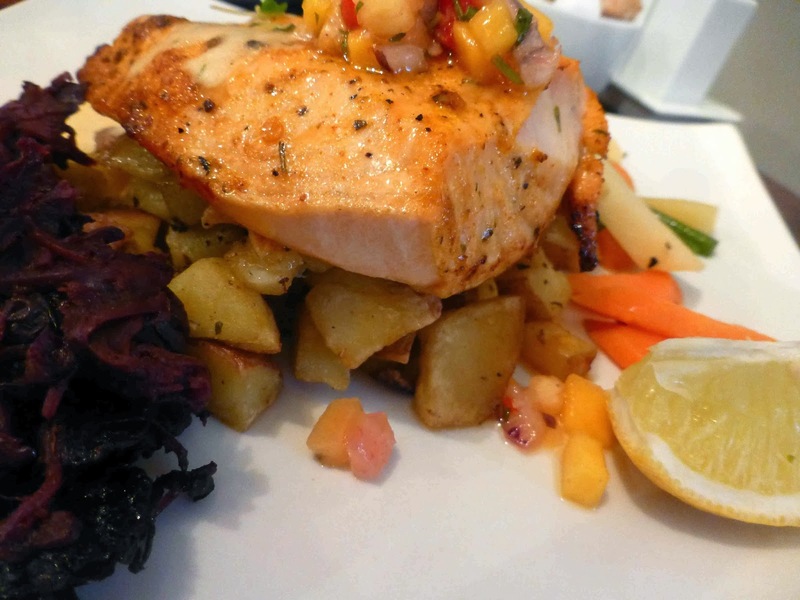 Had seen their Cajun style Salmon with a Mango Salsa and Rustic potatoes and seasonal veg (13.95) on their Facebook page earlier and went for that as my mains. It was terrific, cooked and assembled with a light touch, and thoroughly satisfying; it looked well and tasted well. 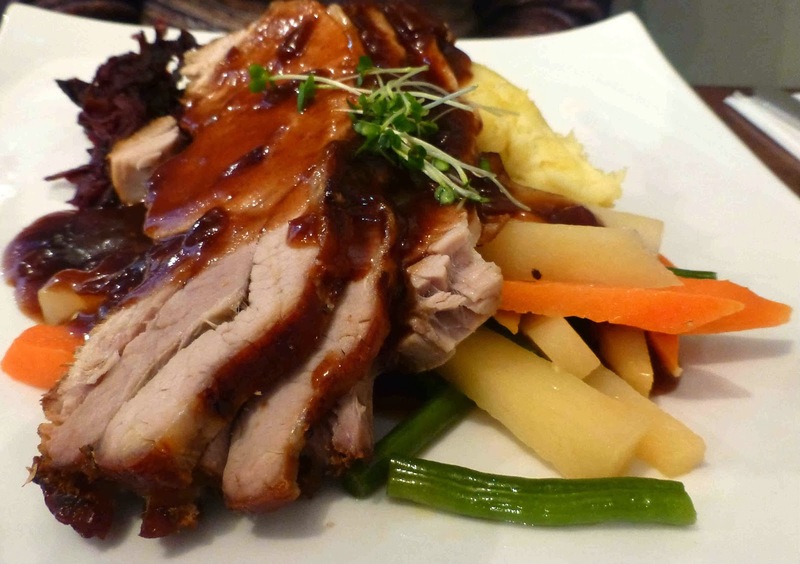 CL too was very happy with another nicely presented special: Roast Loin of sugar baked Pork with an Apple and Raisin Chutney, served with seasonal vegetables and potato (12.95). An excellent piece of meat and enhanced no end by that beautiful chutney! 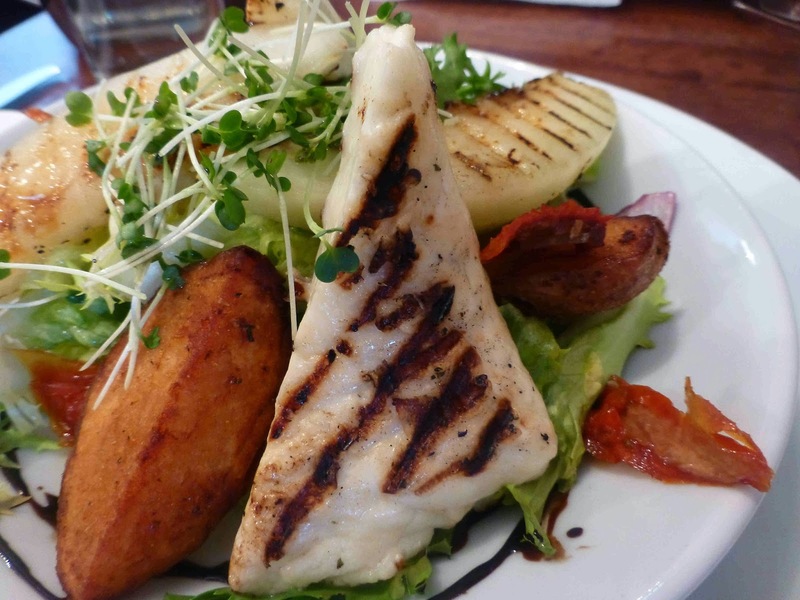 My Halloumi affair continued with my starter, this from the regular menu: Grilled Halloumi with organic leaves, char grilled melon, rustic potatoes and honey and citrus dressing (7.95). That dressing was superb and I totally enjoyed the combination of the cheese and the melon, a combination that I haven't come across in recent weeks. Our other starter was the soup of the day: Broccoli and Courgette (5.50). Much more than the two veg went into this very flavoursome warming bowl. 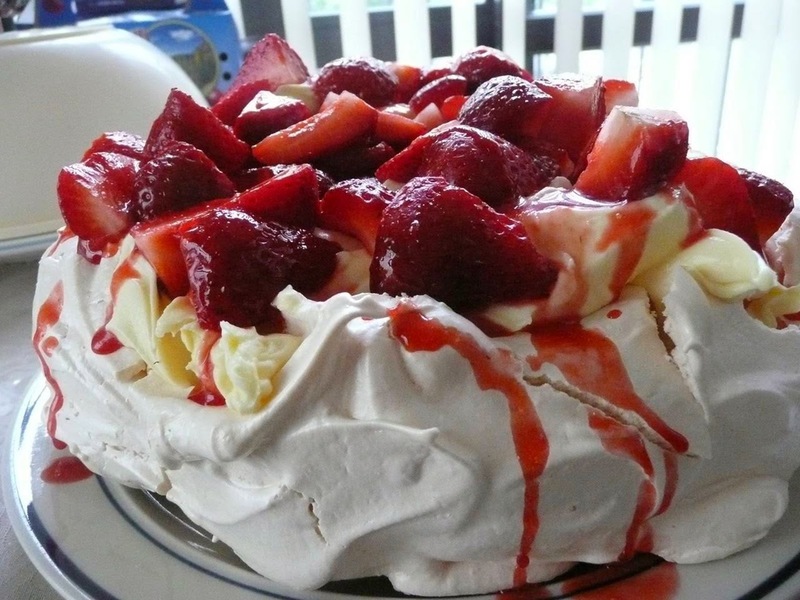 The café puts much of its success down to using “the best ingredients available from our local producers”. 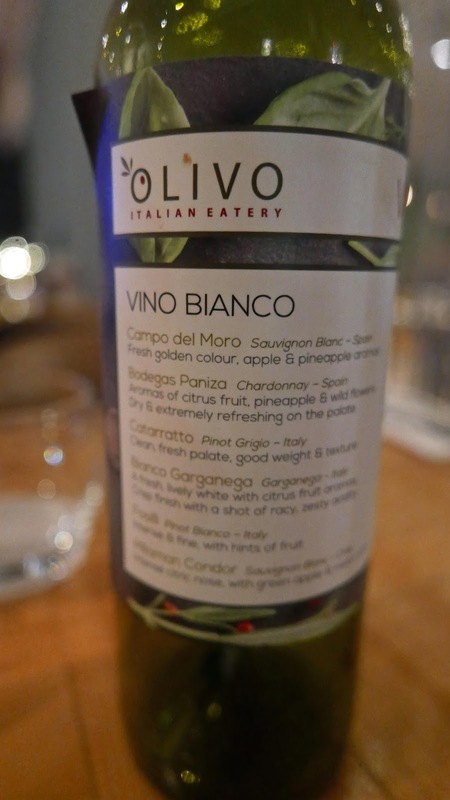 Their website lists Ardsallagh Cheese, Ballycotton Seafood, Riverview Eggs, and Clonakilty Black Pudding among those suppliers and I also noticed Woodside mentioned on the menu. In addition to the café, they have a food store full of their own and other producers’ good things, a huge range of lovely stuff including cakes, take-out meals, soups and chowders and salads. And, they also do outside catering! Monday - Thursday 8AM- 7PM Last orders 6PM. 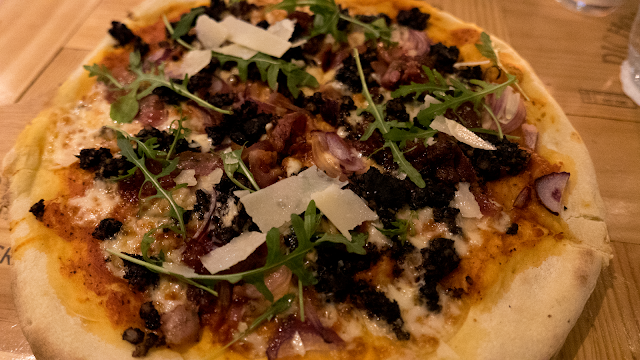 Friday - Saturday 8AM-9PM Last orders 9PM. Sunday 9PM - 8PM Last orders 7PM.